Dr. Meredith Gowens has been with Kings Highway Animal Clinic since her graduation from Texas A&M University College of Veterinary Medicine in May 2007. Dr. Gowens, her husband Geoff, and their sons Aidan and John Paul live in nearby Gruene. Geoff, also an Aggie, works as an athletic trainer in San Antonio. Dr. Gowens veterinary interests include small animal internal medicine and dermatology. She is a member of the American Veterinary Medical Association and the Comal County Veterinary Medical Association. Dr. Gowens has 1 dog, Gus, and 2 cats, Juniper and Lily. Dr. Gowens and her husband enjoy spending time with their family, friends, and pets and feel lucky to live and work in such a beautiful part of Texas. Dr. Steven Guzman joined Kings Highway Animal Clinic in May 2013 after his graduation from Texas A&M University College of Veterinary Medicine. Dr. Guzman hails from Manor, Texas, where he grew up with a variety of animals including cats, dogs and family dairy cows. Dr. Guzman is a true mixed animal practitioner and enjoys practicing on both large and small animals. His interests include bovine and equine medicine, as well as small animal medicine and surgery. Dr. Guzman is a member of the American Veterinary Medical Association and the Comal County Veterinary Medical Association. Dr. Guzman, his wife Kassi, and their sons Jacob and Preston are active members of the Grace Bible Church in San Marcos. In his free time, Dr. Guzman enjoys sailing, working on projects around the house and spending time with his family. Dr. Juan Garza joined Kings Highway Animal Clinic in August 2018. Dr. Garza was born and raised in Houston. He pursued his education at Texas A&M University, graduating with a BS in Animal Science degree in 2013, followed by his graduation from Texas A&M University College of Veterinary Medicine in May 2018. Dr. Garza is a mixed animal practitioner and enjoys practicing both large and small animal medicine and surgery. In his free time, Dr. Garza enjoys fishing, hunting and being outdoors. He has two dogs: Tex, a German Shorthaired Pointer, and Amora, a German Shepherd. Dr. Glenn Pape was the founder of Kings Highway Animal Clinic. Dr. Pape grew up in the San Marcos area and attended Texas State University (formerly Southwest Texas State University). 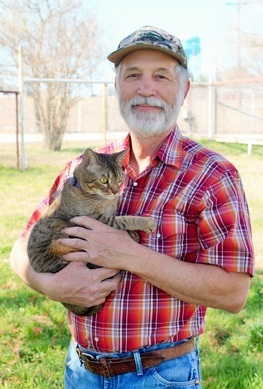 He graduated from Texas A&M University's College of Veterinary Medicine in 1978. He opened the practice in 1980 and it moved to its' current location in 1997. Dr. Pape was cherished and respected by many in the San Marcos and surrounding community for his compassion and devotion to his patients and clients, and his special love for cantankerous cats. He was always willing to share his time, skills and knowledge with anyone who needed it, whether it be family, employees or clients. ​Dr. Pape was a member of the American Veterinary Medical Association, the Comal County Veterinary Medical Association, and a lifetime member of the Texas Veterinary Medical Association. In addition to practicing medicine, Dr. Pape also served on the Institutional Animal Care and Use Committee for Texas State University. Outside of work, Dr. Pape enjoyed ranching Angus cattle with his family, working on various building projects, and spending time with his "herd" of Bengal/Abyssinian cats. ​Dr. Pape passed away on November 7th, 2016. Dr. Pape is survived by his wife Barbara and their son Rex. It is our goal at Kings Highway Animal Clinic to honor his legacy by continuing to provide the high quality care and service that Dr. Pape provided to his clients and patients for over 30 years.